Flat san casciano in val di pesa Search and find home - Agenzia SanCascianoAffitti - Case ed appartamenti in affitto. The town of MONTESPERTOLI. SAN QUIRICO.Convenient to the amenities of the country, good two-roomed apartment recently renovated,with entrance on the ground floor, on two levels, composed by living room with kitchenette , a double bedroom and a service. Partially furnished. Only referenced. SAN CASCIANO val di pesa Montefiridolfi. In the greenery, but two steps from the village, inside the old residence, beautiful apartment on the ground floor with independent entrance, composed by large living room with fireplace, kitchen, two bedrooms, one double, and two bathrooms, plus laundry area. The apartment is left for the exclusive use part of the garden adjacent to the room. Well furnished . Only contracts transient.NO PETS or only small pets. 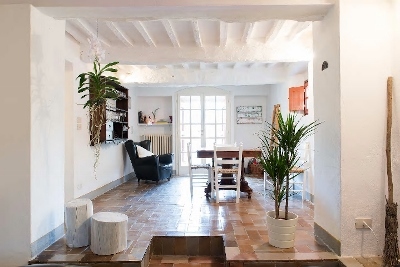 SAN CASCIANO V. P In the historical centre, in a beautiful environment, convenient to all amenities, large 3 rooms of about 65/70 sqm on the mezzanine floor, composed by entrance, eat-in kitchen, a living room and bedroom , plus a service newly renovated. Private garden of over 300 square meters. Delivered furnished. Only contracts transient. Possibility of private parking space with additional amount in addition to the fee.,Only animals of small size. SAN CASCIANO V. P Cerbaia. Immersed in the green with views on the valley, apartment of about 120 sqm with independent entrance from the private courtyard; it develops on the first and last floor in a farmhouse in the small village of three units, consists of large living room with fireplace, kitchen, two double bedrooms, one single bedroom or study and two bathrooms. Not furnished, or delivered with the kitchen. Cars. Independent heating to gpl. About 400m of unpaved road. SAN CASCIANO VP is 2 KM FROM the VILLAGE within the beautiful villa dating back to XV century, characteristic studio apartment with kitchenette, large service, a garden and a swimming pool for communal use. Furnished. Contracts transient. Parking. The rent is inclusive of maintenance charges. SAN CASCIANO val di pesa - a MARKET, NEAR, farmhouse free on four sides of over 200 square meters, beautiful environment, with a court paved and large garden of 400 sqm, ground floor consists of a kitchen, a large dining room with fireplace and small bathroom; on the first floor 6 rooms and 4 services; in addition, laundry area and space equipped with kitchenette and fireplace. Delivered unfurnished or furnished according to the needs of the customer. Only temporary contract, renewable. No residence. SAN CASCIANO V. P, Semi-central. About 2 km from the centre of the village, apartment in a farmhouse of 80 sqm, arranged on two levels. To the ground floor there is a kitchen, a kitchenette, on the first and last floor, large compartment, you can use coma room or living room, a bathroom with window with shower, and two additional rooms. in addition storage room and attic. Shared parking. About 500 meters of dirt road to get to the property. SAN CASCIANO V. P TO TWO KM FROM the VILLAGE in a green and panoramic area. apartment in semi-detached house, on three levels, of about 150 sqm, composed by entrance hall, kitchen, dining room/living room with fireplace, a service, a wine cellar, and large laundry area; first floor: two double bedrooms with a further bathroom with bath, and on the top floor of the characteristic open space with access to the panoramic terrace of the surrounding valley. Furnished. Private garden of about 300 sqm on two sides, terrace, and carport. Contracts transient. Only referenced.